I saw something this morning I have never seen before on Lake Wicwas. I was on a morning paddle to investigate a possible loon nesting on the protected Rawson Woods Islands. Sorry to say, I didn't find a nest, though there was a site that looked like the loons had been up there to assess it for a possible home. (Thanks for the tip MC, and keep watching!) But on the way I saw two Great Blue Herons fly out of tree on a small island. Wondering if there was a rookery there, I looked up in the tree tops, only to find a pure white heron up there! Could it be a Great Egret? It must be: farther along my trip I saw another one, or the same one now fishing along the shoreline, and it sure looks like an egret to me! The closest reported breeding range is the southern coast of Maine, but with the warming temperatures it's not unexpected that animals will be moving their ranges farther north and inland. I'd be interested to know if anyone has ever seen a Great Egret in the Lakes Region. Do you think our local herons were up there investigating this strange new visitor to their lake? On the return trip home I heard the loons farther down the lake hollering at each other, and could see the splashing of their chasing each other reflecting in the morning sun. One loon took flight and landed perhaps 100 yards to the west of me, so I put down my paddle to sit quietly and watch. It swam slowly right toward me, similarly to last week's event. Simply another magical moment on Lake Wicwas. We watched as the parents came and went, bringing dragonflies to feed to the hungry youngsters, who appear to be getting itchy, stretching their necks to get a look over the edge of the nest into the world to which they will soon take flight. I was told these birds nested in the same spot last year, so the decision was made to leave that dead tree right where it is. Another example of how trees that fall into the lake provide homes for many animals, both above and below the waterline. This week we took a trip up to Baxter State Park; I had never climbed Mt. 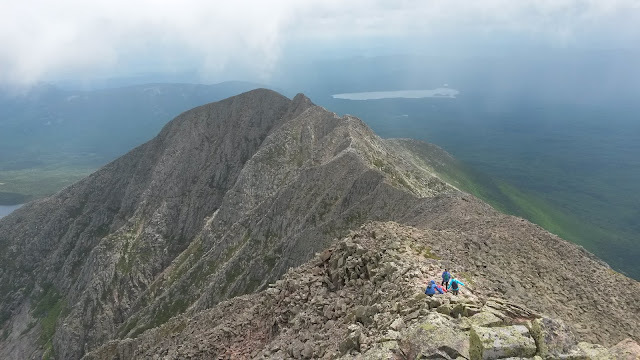 Katahdin and the knife edge, and it had been on my list for a long time. It is beautiful country up there, different than the white mountains and lakes region in many ways. And the mountain is truly spectacular. 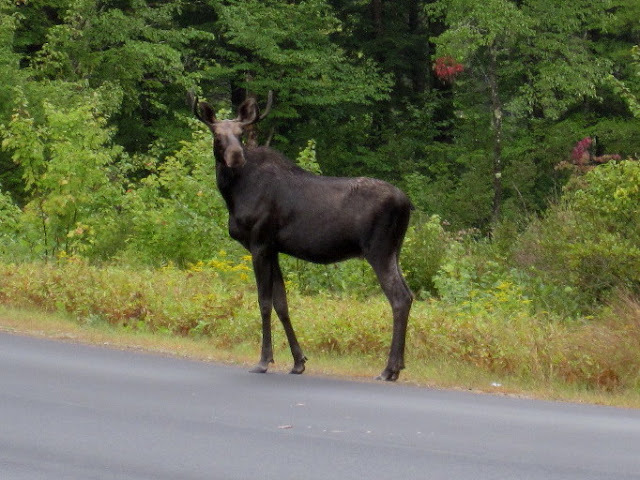 Of course, we were drawn to the many lakes n Baxter State Park, and during a canoe trip on Kidney Pond we saw the two most sought after animals in the park: moose and loons. Kidney Pond is experiencing the same loon issue as Lake Wicwas. While we were there we witnessed territorial fighting as a pair of loons drove away a single loon. Hearing visitors who travel from around the country (or the world), and even the Baxter State Park rangers talking about these beautiful animals made me realize once again just how fortunate those of us who get to experience Lake Wicwas are. We see and hear the beauty of the loons almost every day, and on occasion get to experience a moose right here on our lake. I never forget the wonderful people who have generously given their time and property to protect and steward the special habitat that surrounds Lake Wicwas and much of the town of Meredith and greater New Hampshire. Maybe we will add Egrets to its list of inhabitants. Will you be opening up your expeditions to the paying public? These are so awesome.